How to regain access to lost, hacked and inaccessible Microsoft accounts.–PC Pitstop. Microsoft has instituted a relatively new security measure that can help you regain access to your account should you lose it: the recovery code. The only “catch” is that you have to set it up before you need it. So let’s set it up right now. 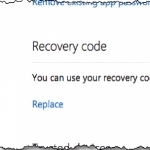 Recovery codes are generated by Microsoft, and must be retrieved before you need them. Once you have a recovery code, you keep it in a safe place until you need it. During this process you may be asked to confirm your identity again using a text or phone message or alternate email address. This is important as it confirms that you are indeed the person who owns the account, and is the person who rightfully can create and hold the account recovery code. leo notenboom microsoft account recovery. permalink.